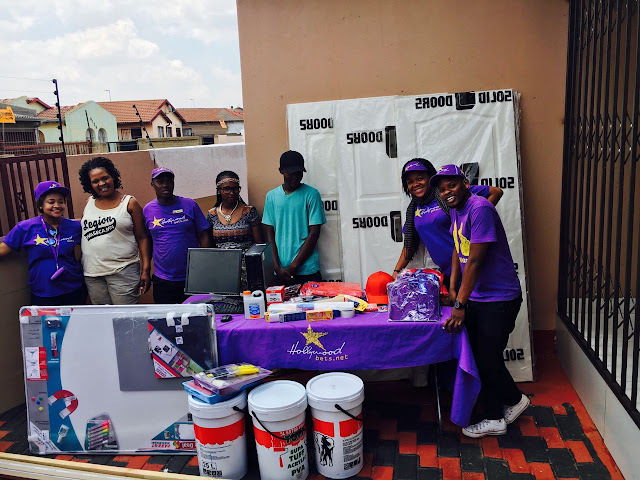 Hollywoodbets Alberton chose Kamogelo Community Centre as their organisation of choice for Hollywoodbets’ Social Responsibility Programme. Keep reading to learn more about this donation. The Kamogelo Community Centre has been doing incredible work within their community for the past five years. They care for people who have been affected by HIV/AIDS. Workers visit the homes of people who have been affected by this disease and help with cooking, cleaning and school work. The Alberton team decided to pay them a visit and show their support. They delivered new uniforms for the care workers, stationery, a computer, doors, tiles, ceiling panels and a whiteboard that will be used for meetings. The centre’s Project Manager, Alphoncina Mopaoalo is thankful for the donation. Kamogelo Community Centre staff members were grateful to receive a donation from the Hollywoodbets Alberton team.